Scratching your head wondering why the pound has been getting lighter lately? Here’s a rundown of the U.K. economic factors helping the British currency climb up the forex charts these days. If you’ve kept tabs on the U.K. market catalysts scheduled last week and the British pound’s forex reaction to those reports, then you’d know that the currency was off to a running start as soon as the CPI figures were printed. Even though the actual results didn’t exactly beat expectations, pound bulls were still pleased with the latest readings. You see, my young padawans, it’s not enough to just look at whether the actual figure came in above or below expectations; it’s also important to check how it compares to ongoing data trends. Headline CPI logged in an annualized 0.1% uptick as expected, an improvement over April’s 0.1% decline in price levels and enough to show that the economy made it out of its brief encounter with deflation. Core CPI climbed from 0.8% to 0.9% in May, also clocking in a small pick up for the month and marking the end of a four-month tumble in core inflation from its 1.4% reading back in January. What’s keeping pound traders hopeful that the U.K. can avoid another brush with deflation is the strong increase in wage growth recorded in April. The 3-month rolling average came in at 2.7% versus the projected 2.5% increase while the March reading was revised from 1.9% to 2.3%. If you’ve been tuning in to the BOE’s monetary policy statements over the past months, you’d know that weak wage growth has been one of their biggest concerns. Policymakers had been wanting to see an increase in wages so that Brits will be in the mood to ramp up their purchases and businesses will have a good reason to increase prices. Talk about hitting two birds with one stone when it comes to boosting consumer spending and lifting inflation! Now that the U.K. economy chalked up a healthy gain in wages, BOE officials might be much more confident about their inflation outlook. While the latest BOE minutes indicated that a Fed interest rate hike might pose risks to global economic prospects, MPC members emphasized that their decision to tighten would be mostly based on U.K. inflation trends. For now, BOE policymakers were still unanimous in their vote to keep interest rates and asset purchases unchanged, but hawkish members McCafferty and Weale noted that their decision was “finely balanced” which is BOE-speak for “so close to voting for a rate hike but not quite.” In his earlier speech, McCafferty already mentioned that the time for raising rates was getting closer and that upcoming data would determine when tightening might take place. From a technical standpoint, the British pound is also showing a lot of bullish momentum, even on the longer-term time frames. As you can see on Cable’s daily forex chart below, the pair was able to break above the area of interest around the 1.5500 major psychological mark a few days back. 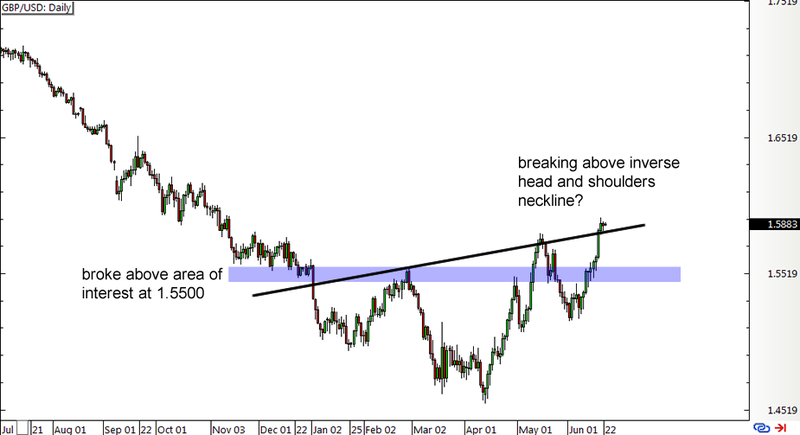 Price seems to be breaking above the neckline of the inverse head and shoulders forex chart pattern too, indicating that a reversal from the previous downtrend could be underway pretty soon. 5. Best option among European currencies? Another factor that’s keeping the pound strongly supported is that it appears as the best option among the other European currencies. While the euro zone has been showing improvements in its economic data, the uncertainty surrounding the Greek debt talks has led some traders to be a bit more cautious in buying the euro. Meanwhile, the SNB’s fickle nature and its reputation for surprising the markets has caused franc traders to tread carefully. With barely any other top-tier catalysts on the U.K.’s docket this week, the pound could be able to carry on with its rallies, especially against the much weaker currencies like the New Zealand dollar and Australian dollar. Do you have any current pound positions?